Eddi Reader was born as Sadenia Reader on August 28, 1959. After working as a session vocalist for a few years, she joined the band Fairground Attraction in 1987. The band made a name for themselves with the hit 'Perfect', but fell apart already in 1989. 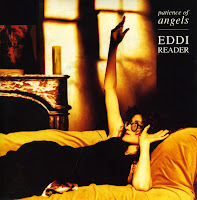 Reader then went solo and released the album 'Eddi Reader' in 1994. The first single, 'Patience of angels' was written by Boo Hewerdine and reached number 33 in the UK singles chart. As much as I'd hated the song 'Perfect', this was a track I found irresistible.